This past weekend, Linnaeus was pretty much obsessed with a fun new plaything. 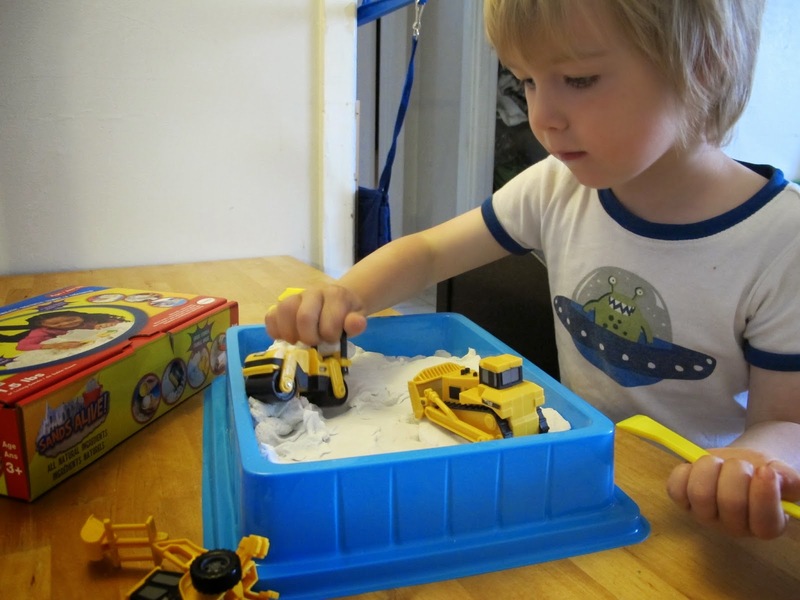 He spent nearly all his waking hours at his play table, molding, sculpting, squishing & driving various vehicles around in three pounds of Sands Alive! play sand. Sands Alive! is 100% natural, nontoxic, does not stain or stick, super easy to clean & is the only compound in the market that has a lab report to prove that it prevents bacteria from growing in it. If you're wondering what I mean by play sand, it's a little bit like play dough or other modelling compounds, but obviously sand is an ingredient. The closest thing I've heard of like it is cloud dough. Sands Alive! is really light & along with sand, it has a binder in it that makes it stick to itself & gives it an elasticity. You can press it into a shape like damp sand to make sand castles or 'cookies', but when you pull it apart, it feels sort of fluffy & soft. It feels really interesting--difficult to describe--& whenever I start playing with it I can't stop. Sands Alive! is advertised as "for ages 3 to 103" & they're not kidding--you WILL want to play with this stuff along with your children or grandchildren! Why is it Spokesmama Approved? Linnaeus really loves Sands Alive! & I do too. The fact that it doesn't dry out is a big bonus. Whenever Linnaeus plays with his play dough, he inevitably leaves some out somewhere & it's crusty & unusable by the next day. Not needing to seal up Sands Alive! or even necessarily put it away overnight is great for longer term projects. I've found it really easy to clean up too. You can just grab a little bit & press that onto stray pieces on the floor or table to clean up. Sands Alive! sticks to itself but doesn't really stick to other things much. So if your child has, say, packed every last bit of the play sand into his recycling truck, you can get it all out without leaving bits stuck in the crevices. After you've played with it you do feel a bit of residue on your hands, but a quick rinse with plain water takes care of that. It's also odorless, unlike any other modelling compounds I've used. I think what I like best about Sands Alive! is that it's a sensory toy. 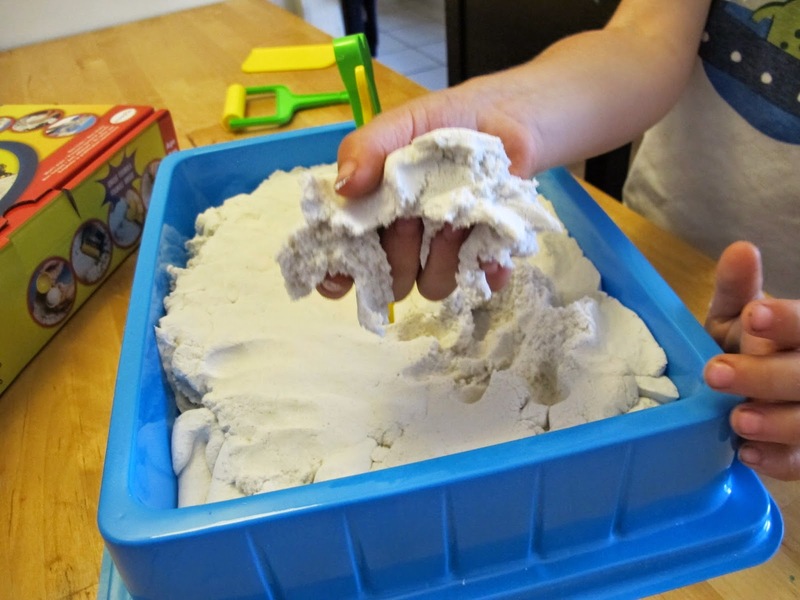 In an age of electronic entertainment--videos, apps, gaming--where kids don't get to use all their senses or even be creative, products like Sands Alive! are so important. I'm sure you know that children learn through touch & smell as well as hearing & sound. Open-ended toys like this offer opportunities to experiment & learn problem-solving skills along with honing their fine motor skills. That's why I was so excited to review this product--I think this toy is really good for kids. Okay, where do I get it? Sands Alive! 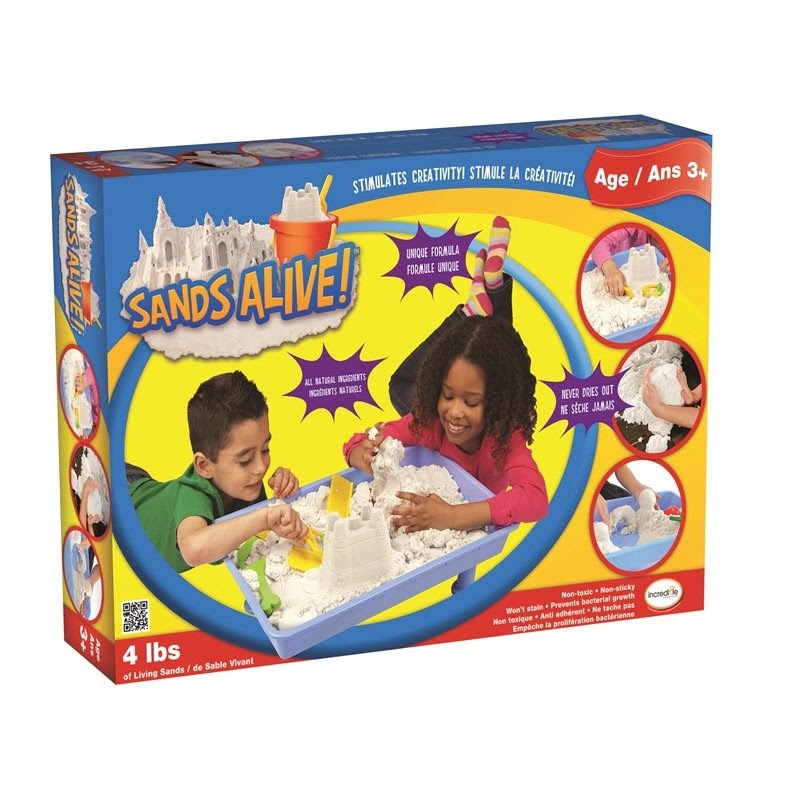 comes in several different kits, from the starter set, which includes 1.5 pounds of sand plus 4 different play tools for $24, to the themed castle, dinosaur, sea life, or sweets shop sets at $30 each, to the Indoor Sandbox set with 4 pounds of Sands Alive, 16 play tools, & 1 large sand tray, for $80. You can find Sands Alive! at your local independent toy store or can be found at the following national retailers: Indigo Books and Music, Chapters, Mastermind Toys, Scholar Choice, Toys R Us, Showcase As Seen on TV Stores, Home Hardware, Co-Op, Pharmasave, PharmaChoice, Calendar Club, & The North West Company. This Sands Alive! stuff is pretty neat, right? Now for my favourite part: I get to give some of this magical stuff away to one lucky Spokesmama reader! The prize is a large Sands Alive! kit, which includes 3 pounds of play sand, a large sand tray, & 14 sand tools! (Value $80+) To win you've got to be a Canadian resident (sorry to my international friends). To enter, use the Rafflecopter widget below. Following me & Sands Alive! on social media will get you more entries & a better chance to win. PLEASE let me know if you have any questions about entering--I'd be glad to help! Good luck! Disclaimer: I was given a set of Sands Alive! play sand for review, but was not otherwise compensated for this post. The opinions & photos above are my own. Owen would probably use it with his plastic sea animals. This product was a hit at preschool. Holy smokes! That looks like fun! I think I would let my son play with it and build whatever he wants! We would probably use sand molds to make animals. the girl will have to fight me for it. I love this stuff. me me me me! Max would stuff all of it into his digger. Great to hear it cleans up easily! Fun! Grady would definitely have his digger in there. It would go in the backyard - that way, less gets tracked in for me to clean up! It's super cool - I bet it would keep her busy for ages! I would let my two boys explore it and play on their own. Love this. I'd put it on our back patio for outdoor play during the summer. we would explore the new texture and it would be something for wee miss to check out with her big brother when he visits this summer! I would LOVE to put this stuff in my sand table for my daycare kids! I'd let them figure out what they wanted to do with it! I know my little boy would ADORE one of these. We have no backyard so this would be go great for him. I think we would build lil roads for his cars! Bailey Dexter Well my daughter would love it with her Barbie's and a few friends. This would be a perfect activity for the birthday party! My daughter loves building "castles"...in sand, dirt, water.....she' would love this!